Cyan have launched a new Kickstarter to fund Firmament their new game aimed at the VR market, although a PC version will also be available for those without VR equipment. Life has a funny way of sneaking up on you. Jeff Zandi has passed away, and with his absence there will be a hole that can never be filled. Texas Magic will never be the same. Throughout the history of Magic in Texas, Zandi has been pretty much the only constant. When I started playing competitively in 2003 he already had the respect of the entire community. It seemed to me he was the elder statesman of Texas Magic, and that he’d always been that way. Read the rest of Ty Thomason’s blog post. 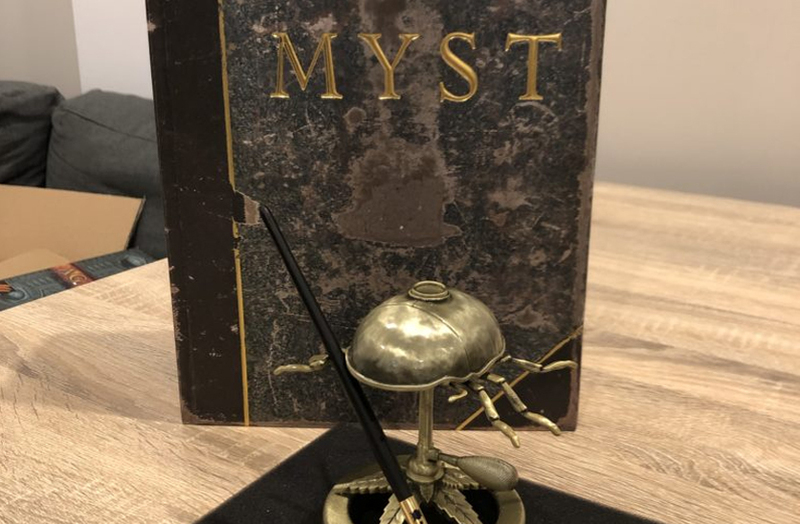 Several backers have been reporting that their Myst 25th Anniversary Linking Books have started arriving. Rium has posted a review upon his blog with plenty of pictures. After a long, long time a new patch has been released for Uru CC by Mark “Chogon” DeForest. The patch holds new new content but does add some features like widescreen support. The Cyan Collection is currently up on the Steam Daily Sale and will be for the next 68 hours. Cyan have posted a new update to Kickstarter about the 5 Myst tracks being produced by Russell Brower and the updated Uru soundtrack. We’ve got emails launching today to deliver the Bandcamp codes for the URU soundtrack with bonus tracks, and Russell Brower’s “Music Inspired by MYST” digital downloads. The email you’ll receive will not only contain two codes – one for the URU soundtrack with bonus tracks, and one for Russell’s fabulous, inspired music – but will also contain these directions with the steps to help you redeem your music. Russell’s Ages Inspired by Myst contains the following 5 tracks. Each track is based from each of the five Myst games. The Uru Soundtrack has been updated with 10 “new” tracks. These new tracks have been heard before in game but not been available outside of the games SFX folder. The new tracks are as follows. Backers will receive a download code for the two soundtracks regardless of the amount pledge (even if you pledged $1). Nov 15 18 Cyan To Publish VR Game Zed. Cyan have updated their Kickstarter page with details on when the physical rewards will start making their way to the backers. We’ve received word from the production house that manufacturing is almost complete! Boats have been reserved and by November 11th the linking books and inkwells will be loaded to begin their journey to your doorstep! It’s been hard to wait for news on this, we know – even we didn’t find out about the product being ready until it was ready! After the boat ride – between 4 to 6 weeks at sea (depending on destinations) – the Myst 25 rewards will be transported to Blackbox’s fulfillment centers for final processing. Centers in Australia, Canada, United Kingdom, and the United States will get their shipments. Then Blackbox will check, process, and pack the rewards for final shipping to your homes. This processing is expected to take between 2 to 4 weeks. Those following along with a calendar can see this means rewards aren’t going to be arriving in time for Christmas. After Blackbox has received, checked, processed, and packed the rewards for final shipment to you, the additional shipping time from Blackbox to each individual means we’re hoping Backers will start to see their rewards arrive by early February. This is our best guess, because until the product is in transit, this is all we know. We’ll keep you updated as we know more information. They went on to state that the physical copies of the games are going to be shipped independently from the Linking Books and there is a good chance they’ll show up before Christmas. Cyan will be posting further updates on this in the future. Finally they had the following to say about the Mac releases of the Myst games. Some of you might have noticed a number of the Myst 25 games for macOS 10.13 have started appearing as available in GOG and Steam. While there was a glitch showing them as playable before they were quite ready, we can now share with you that 6 of the 7 are ready to play NOW! Sorry there wasn’t more fanfare – we did a soft launch in order to catch any bugs that might have crept by our intrepid test team. There are a few bugs we’re still chasing down and addressing as we find them. We’ve also still got a bit more work to do on URU: Complete Collection before the macOS 10.13 build is ready to play for everyone. There are a number things to iron out there. Look for it in the coming weeks. Cyan have paired up with the guys at the Starry Expanse project to offer more models for 3D printing on their Thingiverse page. 5 new models from Riven has been added to the already existing Myst objects that were unlocked via the 25th Anniversary Kickstarter community goals. The new models are Gehn’s Pipe, a Whark, the Maglev, a Riven dagger, and the Telescope that sits above the Fissure. Cyan have released a preview video showcasing the collectors edition box set for Myst’s 25th Anniversary.